Imagine hiking along a wooded trail in Virginia and stumbling upon the stone foundation of a crumbled building, the wooden slats of the walls caved in, the ironwork of the hinges still dangling on the burned out door. This discovery piques your interest—what is this? What’s its significance? How can you find out? 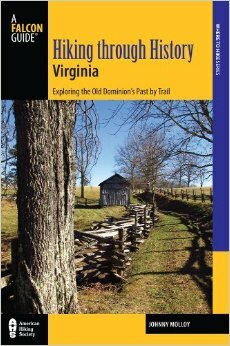 Enter Hiking through History Virginia: Exploring the Old Dominion’s Past by Trail. The hiking guidebook, which profiles forty hikes (all trails, of varying degrees of difficulty), goes beyond simply stating miles and directions and GPS coordinates for each hike to include rich descriptions of the history underfoot. From Civil War Battlefields like the Petersburg National Battlefield to early settlement sites like Henricus from the 1600s, this book is the perfect companion for any hiker with an interest in history. Make no mistake—this is a hiking book first and foremost, complete with rich photos and detailed maps, but with added extras and sidebars detailing enough historical information to satisfy every curiosity along the way. Have you ever seen the Great Falls of the Potomac? The crashing whitewater wonder is truly a natural highlight of the Old Dominion. The area’s history is nearly as impressive. Ol’ George Washington himself commissioned a system of canals and locks to allow barge traffic to navigate around this extensive whitewater froth crashing through Mather Gorge. On your hike, visit the falls, the locks, canals, and even the ghost town of Matildaville, built for the men and families tending the lock and canal system. Hiking at Great Falls Park is a discovery in human and natural history. The Great Falls are just that — great — and a sight to see. Young George Washington, as he traveled the Potomac and surveyed interior lands of the Ohio River valley, saw this crashing cascade, admiring its beauty yet decided the Potomac River as an essential trade corridor if only the Great Falls and other, lesser rapids could the bypassed. An idea was born – a canal system on the Potomac River. What became the Patowmack Canal took the long time to build. Washington’s dream, this canal system linking the Potomac River valley with its access to the Atlantic Ocean and the Ohio River Valley to the west, would bind these two regions economically, strengthening a fragile yet expanding United States. Nevertheless, the rapids of the Potomac River would prove formidable, especially here at the Great Falls. Along this point, the Potomac descends 70 feet in a mile, dropping from the Piedmont to the Atlantic coastal plain through a rugged gorge of exposed bedrock. In addition, remember, this canal was dug using 1700s technology that meant backbreaking labor, although crude and dangerous blasting with powder was used. The canal system was developed not only here at Great Falls but also other places along the river. In some cases, canals were used but also the riverbed was dredged and scoured to deepen it for boat traffic. As the Great Falls canals were being built and after they were in operation, the town of Matildaville came to life. Developed by Revolutionary war hero Henry “Light Horse” Lee, Matildaville was a classic company town – with its company store, superintendent’s house, mill, foundry, and employees dwellings. Yet after all this labor and developing of the canal transportation system the Patowmack Company never realized a profit. They could not even pay the interest on their debt, which was huge due to the exorbitant costs of building the canals and locks around the Great Falls. The fluctuations in the river levels rendered the canals operable only a month or two each year. After being in operation from 1802 to 1830, the Patowmack Canal was abandoned. Its assets were turned over to the Chesapeake and Ohio Canal Company. They were to build a successful canal running parallel to the Potomac just across the river on the Maryland side. After the Patowmack Canal was abandoned, so was Matildaville. The lessons learned in building this canal lock system were used in other projects such as the Chesapeake and Ohio Canal. Today, we can see the leftover relics of both the town and this transportation system standing astride the natural beauty of the Great Falls. 0.0 START by walking downhill from the corner of the parking area near the visitor center, which will be to your right. Immediately meet a gravel trail going left and right, go left on the Patowmack Trail, upstream along the Potomac River. Great Falls roars through the trees to your right. Pass along the Patowmack Canal to your right. 0.2 Pass a spur leading left to the Mine Run Trail. Keep straight. River views open to your right. 0.7 Meet the North River Trail. Keep straight. The North River Trail deteriorates just before coming to the Aqueduct Dam, constructed in the 1950s to provide water to Washington, D.C. Backtrack to the park visitor center. 1.5 Walk out the spur to Overlook #1 after getting south of the visitor center. Impressive views open of the Great Falls from rough outcrops. Walk back out to Overlook #2. 1.8 Soak in the view from Overlook #2. 1.9 Overlook #3 delivers a great panorama both upstream and downstream. Return to the Patowmack Trail and head south. 2.0Split left on the River Trail. A picnic area and the canal remains are off to your right. Begin traversing through incredible boulder gardens, heading down the Mather Gorge. 2.3 A spur leads right to the Patowmack Canal Trail. Stay left on the River Trail and cross a bridge through a rocky mini-gorge. 2.6 Cross the Patowmack Canal, then turn left. Pass a lock. Follow the mini-loop dropping left to the Canal Cut. Continue downstream along rocky Mather Gorge with bluff views. 3.0 Intersect the spur leading left to Sandy Landing. Stay straight with the River Trail. 3.1 Reach an intersection. The River Trail leaves left. Head right on the Matildaville Trail. Climb from the river. 3.4 Come to another intersection. Turn right here, and follow a very short connector then join the wide Old Carriage Road, heading for the visitor center. 3.8 Return to the Matildaville Trail. Keep straight on it toward the visitor center. The other direction on the Matildaville Trail takes you past the quarry used to obtain stone to build the Patowmack Canal. 4.2 Come to the heart of Matildaville. Here are the ruins of the superintendent’s house and a lock of the canal is just downhill. Look around for other ruins. 4.3 The Old Carriage Road comes in on your left. Keep straight, bridging a stream then reach a restroom building and alternate parking on your left. Pass through a scattered picnic tables and resting benches. 4.6 Come to the south side of the visitor center. This is a good time to head in to learn more about the park. 4.7 Reach the parking area, completing the hike. Historic Tidbit: The lock and canal system skirting around Great Falls, commissioned by George Washington, took 17 years to complete. It is strange how sometimes two dissimilar things become associated with one another. Back in the early 1900s, an amusement park was located at the Great Falls. One of the pastimes at this amusement park was riding the carousel. The music from this ride drew in children of all ages. The carousel featured 40 animals on its revolving circuit. Riders would pick their favorite critter and go ‘round and ‘round, a smile coming up on their faces. However, in 1936 the Potomac River flooded and destroy the carousel’s organ. The owners of the carousel jumped into action and were soon back in business. Then the music and the carousel stopped again at the Great Falls. In 1952, Fairfax County acquired the land around Great Falls for a park. The carousel owner did not want to become an employee of the county and dismantled the Denzel Carousel. Visitors to the park longed for the music, the rides, and the memories the carousel provided. A carousel was purchased from Rhode Island and moved to Great Falls Park. Once again, children laughed as they sat atop the various animals in the carousel. However, changes were afoot; in 1965, Fairfax County ceded the park to the National Park Service. The national park people wondered if the carousel was in keeping with the natural and historical aspects of the Great Falls. However, the carousel was allowed to continue operation by the National Park Service after a letter writing campaign by the citizenry. Nevertheless, the end of the carousel came in 1972 when Hurricane Agnes flooded the Potomac and Great Falls Park. It simply cost too much to repair the carousel. The iconic ride was removed, ending seven decades of riding to the music by the Great Falls.